The Lifesize Phone HD is the smartphone for your meeting room. 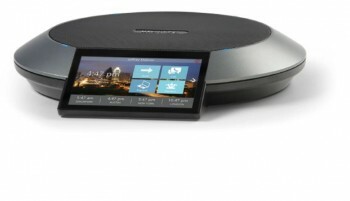 A touch controllable hub for all of your audio, video and web conferencing calls. An essential part of your meeting room, the Lifesize Phone HD allows everyone to share content, launch calls, join meeting and change layouts with all the essential conferencing functions at your fingertips. With the Lifesize PhoneHD, you can make calls and manage video and audio calls, and web conferences, through an intuitive touchscreen interface, making it easier than ever to collaborate freely with colleagues, customers and partners. By combining superior audio quality with a HD touchscreen in your meeting room, your teams can engage in more productive meetings and everyone can experience more effective video communications. The intuitive touchscreen is inspired by the best User Interfaces in the mobile space, with elements logically placed on the screen and predictive actions enabling users to make a call and start conducting business quickly. With a 360 degree microphone array, a large, acoustically suspended speaker enclosure and a frequency response of 90Hz to 22kHz, the Lifesize HD Phone with the Lifesize Icon provides natural voice reproduction that enables clear, superior audio and video communications to take place. Plus, the advanced beam-forming technology steers microphones towards the person currently speaking to reduce unwanted background noise, ensuring everyone can be heard, no matter where they are located in the room. It’s time to work smarter. By delivering simple cloud Video Conferencing through the Lifesize Cloud, with the Lifesize Icon Video Conferencing systems, business can take place and decisions can be made, no matter where people happen to be. An essential part of the Connect Experience, The Lifesize Phone HD is your connection to all the benefits of the Lifesize Cloud, wrapped up in a beautiful, easy-to-use solution. VideoCentric are the UK’s leading integrator of Lifesize Video Conferencing and Collaboration Solutions, and are experts in both hardware and cloud services. Fully accredited with all the worlds’ leading manufacturers, we are fully independent, enabling unbiased solutions to be tailored to your business, whatever your requirements. Plus, with the UK’s most experienced technical team, with 7 maintenance and support packages available to be tailored to your needs, you can be sure that wherever you are in your Video Communications journey, we can help you along the way. VideoCentric are a Lifesize Gold Partner, the highest possible accreditation level from Lifesize, and are only 1 of 2 partners in the UK to hold this expert level of accreditation. VideoCentric have also been named Lifesize Cloud Masters – the only UK partner to be awarded this level of recognition. Both our Sales and Technical teams are trained at Expert level, and our extensive experience and knowledge of LifeSize Endpoints, Lifesize Cloud and Lifesize UVC Infrastructure has enabled us to provide support for a single system through to some of the most intricate and complex video infrastructure set ups and integrations. VideoCentric also boasts the UK’s most comprehensive demonstration and interoperability suites to ensure full interoperability for all VideoCloud solutions. We invite you to come and see all the systems in action under one roof and compare them side-by-side for yourself. See “The Connected Experience” to see how to bring together the Meeting Room, Mobile Users, Desktop and Cloud for an Incredible Video Conferencing Experience.